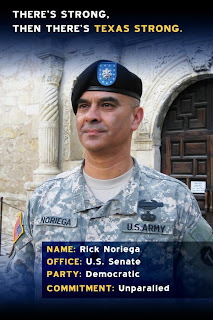 Rick Noriega, the Democratic nominee to replace Bush enabler John Cornyn for the U.S. Senate seat for Texas, this weekend won the Blue America Senate contest with 947 donors who contributed $20,500. On Sunday I attended the "Vote Democratic to Fix Our Future" dinner hosted by the Texas Democratic Women of Collin County where Col. Noriega was one of the speakers. In his remarks about the financial mess George Bush, John McCain the Republican Party have given American taxpayers Noriega said, “I am outraged that taxpayers are having to foot the $700 billion bill to clean up the mess made by greedy Wall Street investors and mortgage lenders. This is what happens when John Cornyn takes nearly $1.5 million from the perpetrators of the crisis, spends six years championing an anything goes culture on Wall Street, and abdicates his duty to protect Texans from Wall Street greed. Cornyn’s special interest record is something Texans have come to expect but can no longer afford." John Cornyn has new campaign ad out where he says, "No one is happy with the way things are being done in Washington" and America needs real change. Senator Cornyn is right, we do need real change - Texans need to change the political leaders who have taken America down the wrong road for the last eight years.